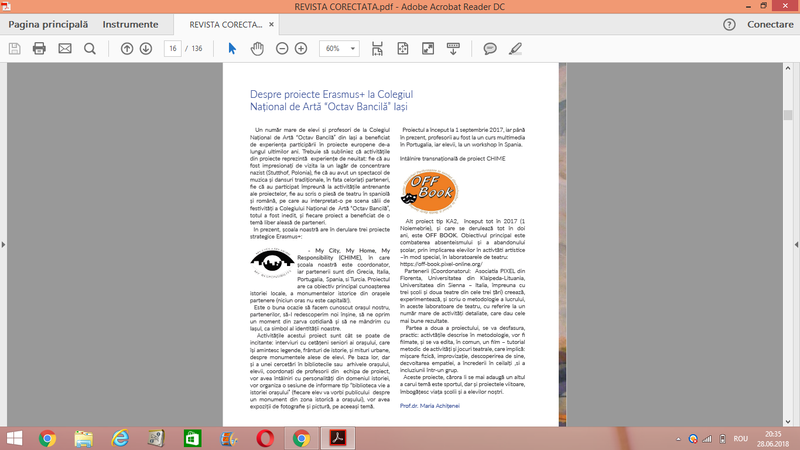 Article in the school magazine "CLARITATEA", ISSN no 2344 - 6676. No of issue magazine: 13 / 2018 The school magazine "Claritatea" is read by the present students and the former students of our school, especially the ones who live abroad or in other cities. It is also read by the parents of our students, by the school teachers and also by teachers of other schools, as it has been making a name among the magazines of all high schools in town. The article presents two of our school's Ersmus+ projects, one of them being OFF BOOK. We expect some of the teachers who read the article and opened the Off Book web site to try to put in practice the activities (TABS) in the Theatre laboratory developed by the project.